I believe a few of the bloggers that I stalk follow will definitely agree to this when I say I have been whining over their cute jackets for the last couple of months. Finally I found my own, and right on time, because the Belgian weather has not been that good lately. I also found myself a perfect striped tee. I have been looking for one like this for aaaaaaaaages! I found it at H&M while I was actually searching the racks to find that skirt I wore in my previous outfitpost. It was love at first sight. Haha, my freckles make my face look grainy! Please excuse me for looking down in almost every photo. The dog was jumping on me and acting all crazy! your jacket is totally chic! I have that exact same flower and love wearing it on shirts. It makes any outfit feminine feeling. I never would have thought of pairing it with a striped shirt though. What a great idea! That looks so pretty on you! 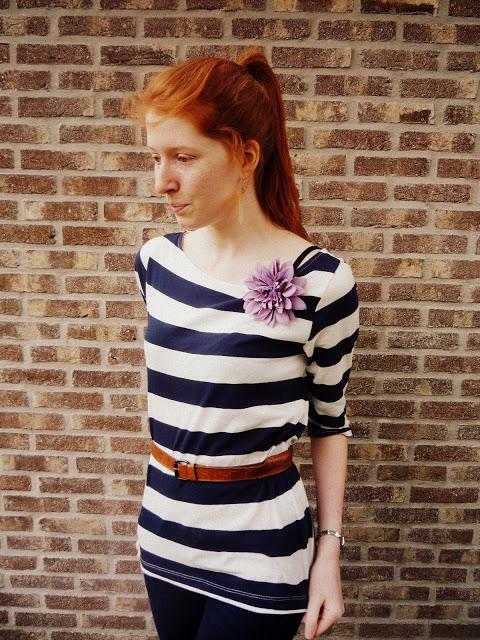 I love it with the belt and the flower- you are great at accessories! i'm a huge fan of brown belts and striped tops..together makes it even better! and you followed through with that flower brooch inspiration:) the closest H&M to me is 5 hours. not close enough i tell you! I love the looser fit of the blouse and how you've belted it and added the purple flower. You're just the cutest! By the way, to answer your question, the dress in my last post was from Forever 21 (their Love 21 line) :). Cute jacket & shirt..I love your hair! It's so pretty! There is just something so sweet and perfect about stripes with flowers! 🙂 lovely casual outfit! you got a really cute and beautiful blog i am your newest follower please follow back 🙂 your style is lovely!! Echt een super leuke jas! I love anything that has stripes! You look super cut! that last photo is so beautiful! and high five freckles!! try the hobbit! it's really, really easy to read, and quite humorous too!i haven't read LOTR as we've got the omnibus too, it's formidable! Everyone like the jacket, and so do I! I also like your face. Following! Congrats on finding the perfect jacket. I love your striped tee with the brown belt. I think it's very chic! you are just adorable as ever. Hehe. I gotta say, I love your freckles 😀 I've always been envious of people with freckles, for some weird reason. Love your jacket 🙂 It is so super versatile. + love the stripes too. Ik heb het jasje in het groen, het roze stond mij uiteindelijk niet zo goed! 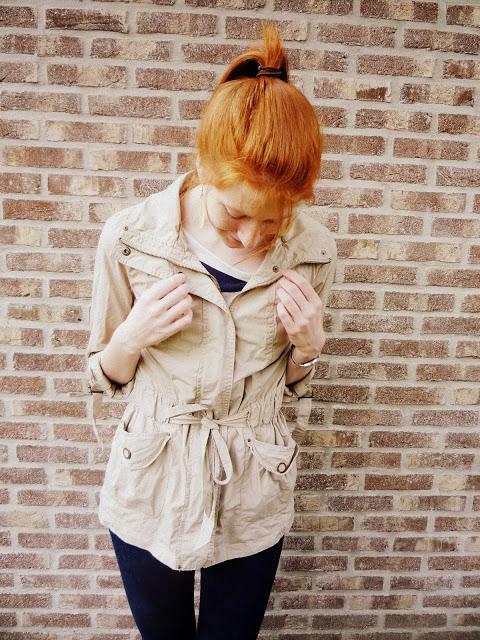 such an adorable jacket! so summery- love it. That's a great striped top and light jacket! 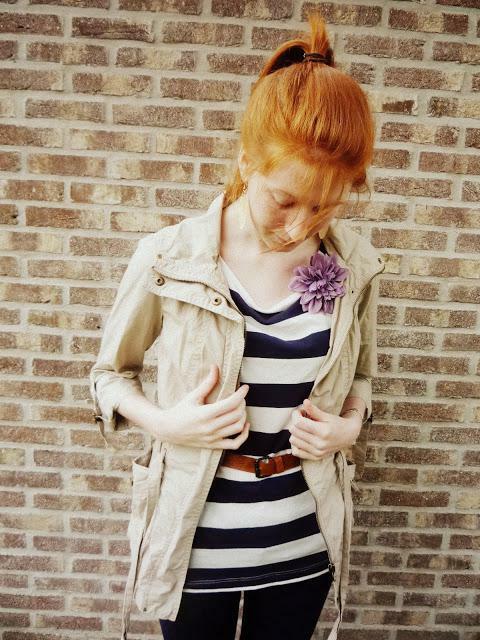 I'm so happy you've found the perfect jacket and the perfect striped shirt! I feel like the hunt for 'the perfect thing' sometimes goes on forever! I love stripes, especially navy and white ones. Your jacket is so chic. Can we follow each other?? We’re already following you!!! Hope you’ll follow us back!! The lilac flower is a lovely touch! lovely outfit!! 😀 I really like how you look! You're ridiculously adorable. I love the tee! I really could never have enough striped tees. I always find myself looking at them in stores, and then I realize I already have a shirt that looks just like it. And I love your freckles. I don't think your face looks grainy. Leuk h&m shirt en ik heb denk ik dezelfde broek van levis :D.
I wish I had red hair like that to match my freckles:) Your hair is gorgeous!! And what a lovely jacket!! I'm sure it was worth the wait. Definitely a great jacket and top!! Stripes will always be an A+ in my book. 😉 I also love your gorgeous hair!! The color is so firey.. loves! Cute. You are freakin adorable.